We pride ourselves on "going the extra mile" for our clients, and we want to do the same for you. 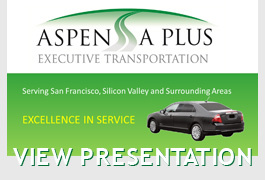 So whether you're looking for a corporate car service or personal transportation, count on Aspen A Plus Executive Transportation for uncompromised professionalism, punctuality and quality San Francisco Bay car services. We operate 24 hours, 7 days a week, 365 days a year to make your business travel experience the best it can be. Your convenience and safety are always our top priority. Aspen A Plus Executive Transportation offers a wide variety of San Francisco Airport car service and SFO Airport SUV services. Whether you are traveling alone or with a group, we're ready to help you meet your airport transfer needs. We offer executive car service to and from the San Francisco International Airport. 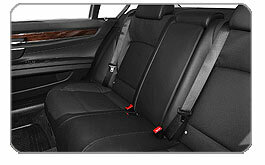 Our sedans seat up to 3 passengers comfortably with room for luggage. For small groups we recommend our executive SUV's or 8 passenger limousines. Feel free to contact us at anytime to request a quote, reserve a car or SUV on a specific date or see how we can accommodate your special occasion transportation needs.